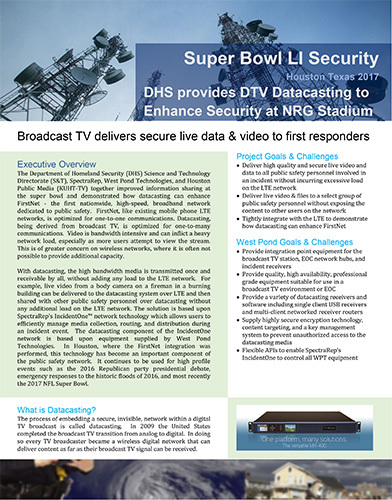 The Department of Homeland Security (DHS) Science and Technology Directorate (S&T), SpectraRep, West Pond Technologies, and Houston Public Media (KUHT-TV) together improved information sharing at super bowl LI demonstrating how datacasting can enhance FirstNet – the first nationwide, high-speed, broadband network dedicated to public safety. FirstNet, like existing mobile phone LTE networks, is optimized for one-to-one communications. Datacasting, being derived from broadcast TV, is optimized for one-to-many communications. Video is bandwidth intensive and can inflict a heavy network load, especially as more users attempt to view the stream. This is of greater concern on wireless networks, where it is often not possible to provide additional capacity. The solution is based upon SpectraRep’s IncidentOne™ network technology and West Pond’s FlexStream datacasting technology. The FlexStream MX-400SR, MX-400IO, RR-ST1000, and IPDforPC software are key components of the datacasting network. This equipment provides a portal through which datacasting media is injected into the broadcast TV network and then received by authorized network users. In Houston, the PBS member station KUHT provides the broadcast TV datacasting bandwidth and as such was outfitted with the FlexStream MX-400SR. Datacasting receivers were enabled in patrol cars, mobile operations centers, municipal buildings, key private offices and helicopters. USB receive devices enabled individual users while the RR-ST1000 receiver/router was used to enable devices on LANs and WLANs within vehicles and buildings. The University of Houston and the Houston Police Department emergency operations center were each equipped with a FlexStream MX-400IO. These two locations have access to hundreds, if not thousands, of live security cameras which become datacasting media assets during an emergency incident. The MX-400IO provides live encoding of the security camera video and transmits that to the MX-400SR at the TV station (KUHT). This transmission leverages a secure adaptive bitrate encoding protocol developed specifically for datacasting. West Pond’s Engineering Services team preconfigured and tested the unit for use with supporting equipment. and MX-400IO devices during the event. The following features of the FlexStream Datacasting System were utilized. 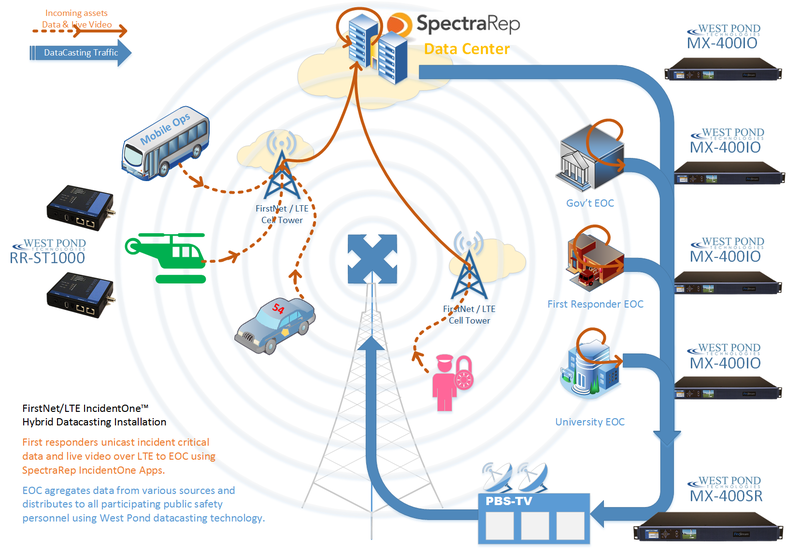 Datacasting transmissions included file data from SpectraRep software and encoded AV from a variety of MX-400IO systems. West Pond FlexDM remote management system provides SpectraRep and West Pond staff with access to the device from anywhere. Dynamically controlled by SpectraRep software at the IncidentOne Data Center using the MX-400SR and MX-400IO management API. In Houston, where the West Pond, SpectraRep, FirstNet integration was performed, this technology has become an important component of the public safety network. It continues to be used for high profile events such as the 2016 Republican party presidential debate, emergency responses to the historic floods of 2016, and most recently the 2017 NFL Super Bowl.